Did you know Hayling schools make Hampshire’s top 10 most congested? That’s awful for such a flat, compact community. All of the 5 Hayling Island schools lie on the busy main road (Havant Road, Church Road & Elm Grove) which serves the Mengham shopping area, and the entire large residential area at the south of the island. At rush hour it’s even busier, with lots of queueing. The proportion of pupils and staff who cycle to school is very low, according to Hampshire County Council Travel Team . 79% of pupils are driven to the two Mill Rythe schools. The national average is 34%. Most schools’ walking rates hover around 50%. The last figures we have for Mill Rythe Infant school showed only 4.5% of pupils walk and barely 18% to the Junior school. A questionnaire conducted at Hayling College showed that 10% cycled against 50% using a car. Those that do cycle are often seen using the pavements around Hayling College. Since the Travel Team survey, the Cinder Track has been upgraded for cycling by Hampshire County Council. although the surface is stony, and not very easy for pushchairs or scooters. Mill Rythe Junior School conducted a new survey of travel behaviour which found that car use has fallen to 68%, 16% walk, 12% cycle or use a scooter, and 4% use the bus. That suggests a significant improvement that we hope to continue over time. The links below explore the benefits and issues of school cycle routes and describe the main routes we are working on. Cycling gives children exercise in the open air, increasing fitness and encouraging an active lifestyle. It also gives them independence from the “Mum and Dad taxi company”. Training schemes – notably Bikeability – help children learn how to cycle safely, manage risk and to take responsibility for their actions. They say “You never forget how to ride a bike”. It’s true, many adults getting back into cycling first started as children. Equally, people that never learned to ride a bike as children can see learning in later years as difficult. Safe cycle routes to school which avoids roads would reduce risk not only for the children but also for pedestrians and other road users. It’s immediately noticeable when schools are on holiday. Our roads are much quieter immediately before and after school times. Safe cycle routes to school means fewer children being driven to and from school by car – for most parents cutting out four car trips a day! The congestion of parked cars around school gates is reduced and the short, fuel inefficient, jouney to school is avoided. 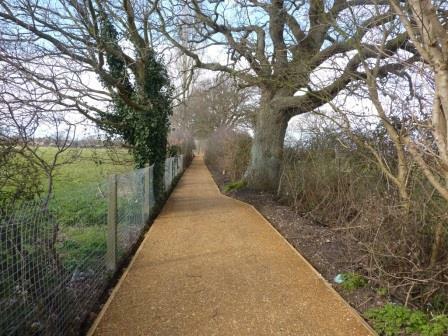 Mill Rythe to Tournebury Lane via Eastwood Close, Footpath 88, was upgraded for cycling in 2013. The old cinder surface (hence the name Cinder Track) was given a wider and somewhat smoother surface and made officially available to cyclists. People have always cycled it unofficially, but now it can be signed, and we can put it on our cycle map. However. people tell us the surface is stony, and not easy for pushchairs, buggies or scooters. It is more all-weather than before, and less subject to puddling, but not ideal. The footpath borders the Hayling College playing fields with a spur footpath running along the southern border with entrances onto the college grounds. We had hoped for a new path extending the upgraded Cinder Track directly into the Mill Rythe Junior and Infant schools so that children no longer have to navigate through parked cars and cars dropping other children off to school. £10K funding was potentially available from Living Streets, with another potential £10k matched council funding. We had the support of the landowner and all the stakeholders. However, we ran into big complications with ecology and cost, which we could not find a way around at the time. The landowner even offered to perform the work for the available funding, but as they were not ‘an approved HCC contractor’, we were refused permission, to great frustration of all those involved. It remains a long term ambition. This is the first leg of the new East-West cycle path, and is included in HBC’s 2017 Feasibility Report, and now in the project list for 2019/2020. 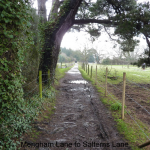 It involves converting the existing public footpath 89 to dual use. Since it runs through the church graveyard, it has involved sensitive negotiations with the church, but these appear to have been overcome, although cyclists will be asked to walk through the graveyard itself. However, although Parkdean, who own some of the land, have given verbal approval, we understand they still haven’t given HBC legal approval to start work. There is also an issue with an anti-motorcycle barrier, which does not actually stop most anti-social motorcyclists, but does stop many legitimate users. Also, the councils are insisting on a rough unsealed surface, which puts off many users, especially in wet weather. We think our ‘Smooth the Path‘ campaign applies just as much to this path as any other. Kids cannot get to school covered in mud! Since the Halyards Estate was built, we have a good-ish sealed route from Beech Grove to Mengham Junior School and the Legion Field. And there will be a sealed path from Hawthorne Grove across the Legion Field. Mengham Infant School is directly across the road (Elm Grove) to the west. 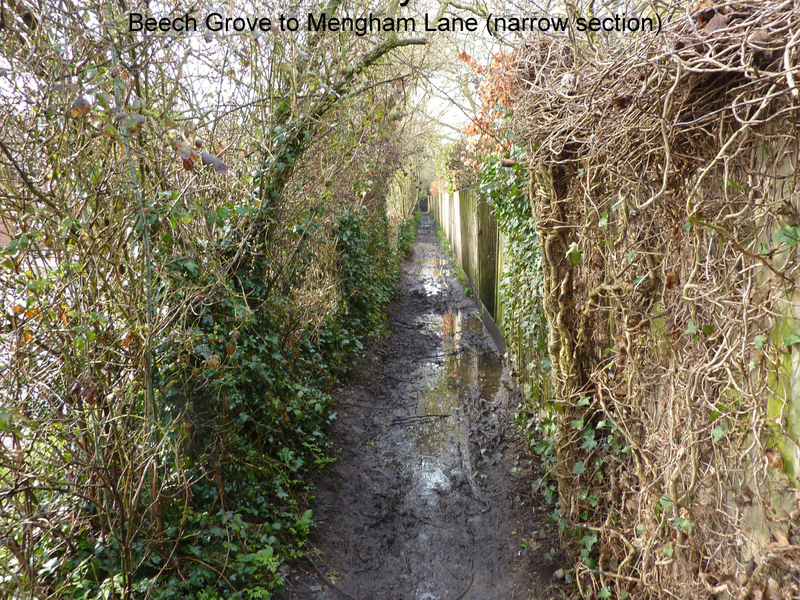 However cycling further south to Mengham Lane remains a stubborn problem. Bellway could easily have left a path through to Goldring Close, but they refused point blank, and because the planning was initially refused and then won at appeal, the council lost all rights to insist. That is a massive failure of the planning system to protect the community from commercial pressures. Although many people do cycle on public footpath 102, it is not officially permitted, so we and the council can’t add it to our cycle maps, and the council won’t signpost it. There are two paths to it from the Halyard’s estate , but the last 110 metres are very narrow, and in wet weather, it’s completely impassable for anyone. The 2019 council plans include levelling and improving the surface, and improving the drainage, but it will not be all-weather. And they will not open it up to cycling, because it is too narrow. The photo shows the last 110 metre section running parallel to My Lord’s Lane. 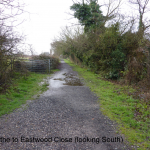 There is a perfect alternative path alongside it, which the landowner did initially consider allowing for cycling, but this offer was subsequently withdrawn. We remain hopeful they might be persuaded in future. The most northerly part of footpath 102 (approximately 310 metres) is wide and often cycled, but since you can now cycle through Halyards, it will not be permitted as an official cycle route. There is a short spur public footpath (101) along the back of Mengham Junior school grounds, linking Legion Field to Heron’s Way. This is muddy and flooded in wet weather, and badly needs a sealed surface. 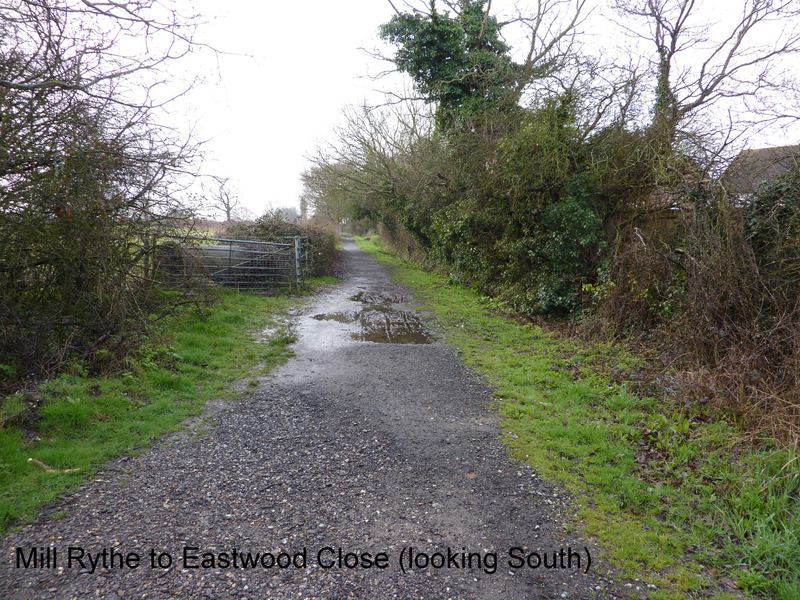 However, although it runs along the side of the housing estate, it is still classed as a ‘rural’ footpath, and HCC will not allow it to be sealed. It’s too narrow to be officially a cycle route, although people do cycle it, but parents with children should be able to use it without needing wellingtons. The southern section of footpath 102 is a wide, cycleable path of approximately 300 metres. It just needs an all weather finish, and removal of the exposed barbed wire, and this has been approved in principle. However the tree roots make a decent all-weather surface problematical and expensive. The horse field next to it is now being considered for building over the next few years, and if this happens, we have been promised that it would include a proper cycle path, and therefore the council is reluctant to spend money on a short term solution. This is all very well, but we were let down on the Goldring Close development, and in the meantime, the detour through Mengham is long and dangerous. 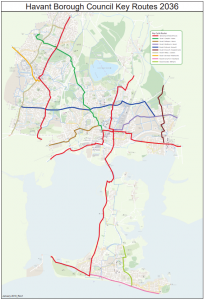 We are running this as a separate project in its own right because it would provide a major route for all types of cyclist including those looking for a traffic-free route onto and off the island. Would the children use the routes? The upgraded Cinder Track Is already popular, despite the poor surface, and there is evidence it has reduced car use somewhat. Wouldn't they cost a lot? We don’t believe so. 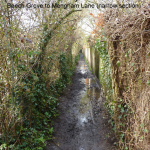 We’ve spent time looking at the routes with Havant Borough Council, Hampshire County Council and the land-owners, and most of the cost will be upgrading the current surface. Compared to road improvements, the cost is miniscule. Our ‘Smooth the Path‘ campaign shows that a proper sealed surface only costs 15% more than the inferior rough surfaces we’re currently using, and need no maintenance for decades instead of a few years. Do teaching staff support cycle routes? Throughout the progressing of this scheme Cycle Hayling has discussed the proposal with representatives from all the Hayling schools and kept them informed of progress. They have been very supportive and keen to see these routes implemented. Mengham Junior School is leading the charge, and has already the ‘Silver’ award for sustainable travel with Modeshift Stars. Yes. Safe cycle routes to school are a high priority – for obvious reasons. There is funding set aside specifically for creating safe routes to schools. 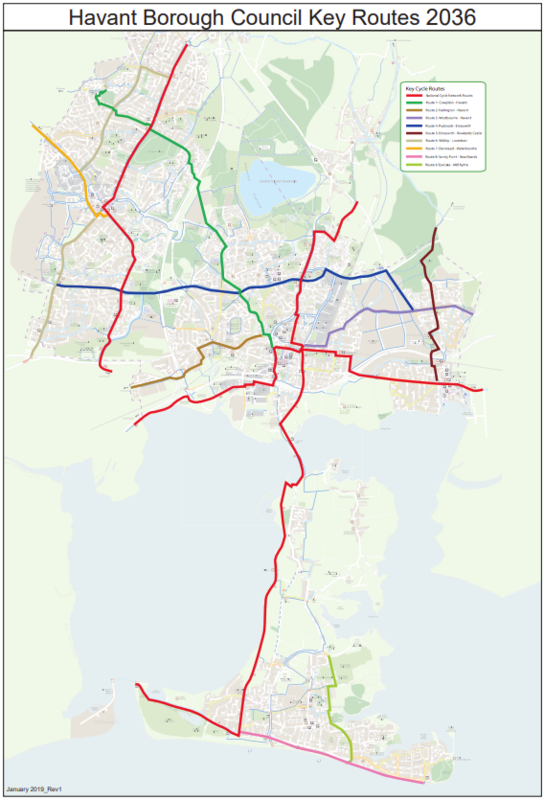 Cycle Hayling first proposed this scheme in 2010 and Hampshire County Council and Havant Borough Council have been supportive ever since. 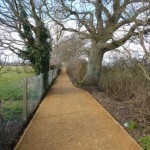 Hampshire County Council has already upgraded the Cinder Track and are keen to do more as funding becomes available. But they are resisting the use of sealed surfaces, which is preventing all-weather use and getting into the habit of everyday walking and cycling. If you want to support our efforts, please register your support. 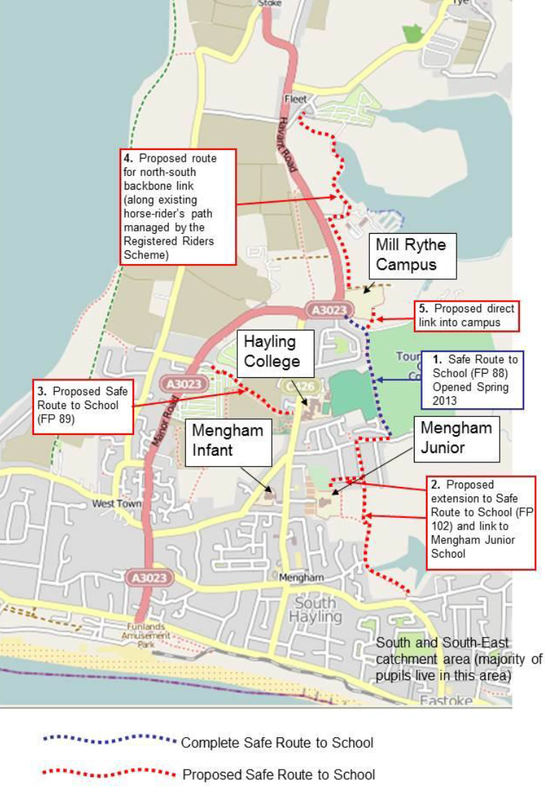 Cycle Hayling is investigating other possible additions to the Safe Routes to School scheme. If you have any suggestions, please let us know. 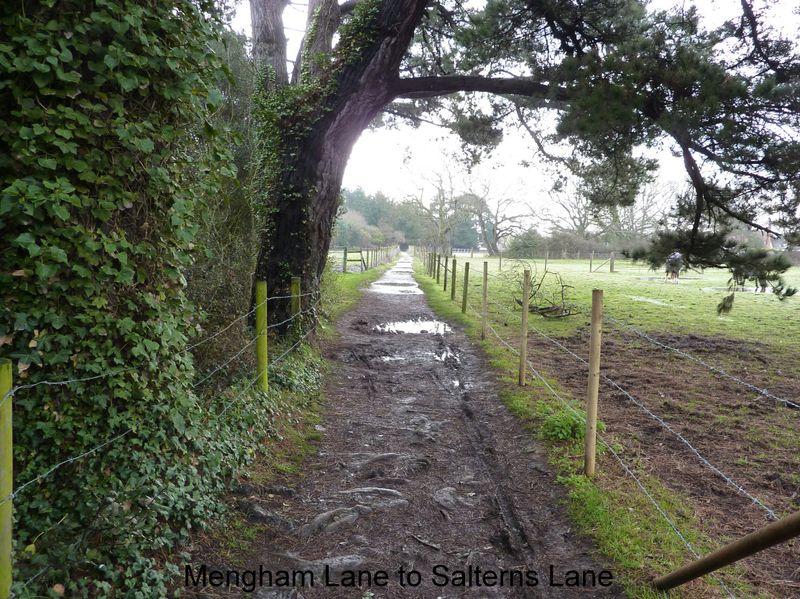 Footpath 101 runs behind Mengham Junior School. The closure starts 28th February 2015.